Housed in the late 16th century Canongate Tolbooth opposite Huntly House, ' The People's Story ' is a museum with a difference. As the name implies, it uses oral history, reminiscence, and written sources to tell the story of the lives, work and leisure of the ordinary people of Edinburgh, from the late 18th century to the present day. The museum is filled with the sounds, sights and smells of the past - a prison cell, town crier, reform parade, cooper's workshop, fishwife, servant at work, dressmaker, 1940s kitchen, a wash-house, pub and tea-room. 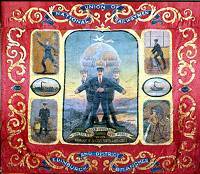 These reconstructions are complemented by displays of photographs, everyday objects and rare artifacts, such as the museum's outstanding collections of traded union banners and friendly society regalia. A twenty-minute video presentation supplements the museum's storyline.